Another Longtable dinner at The Pumphouse Pub has come and gone and with Beerthirst hosting and Green Flash Brewing Co. as the featured brewer it was one I was looking forward to. Greenflash makes amazing beer, their West Coast IPA is in my top 5 for bottled beer and is probably my number 1 draught beer. 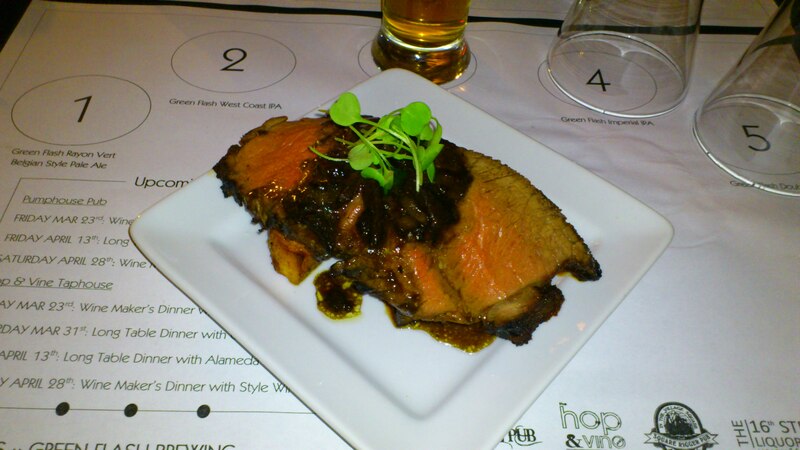 This was a 5 course affair with a unique beer pairing for each course, as is the case with every Longtable dinner. 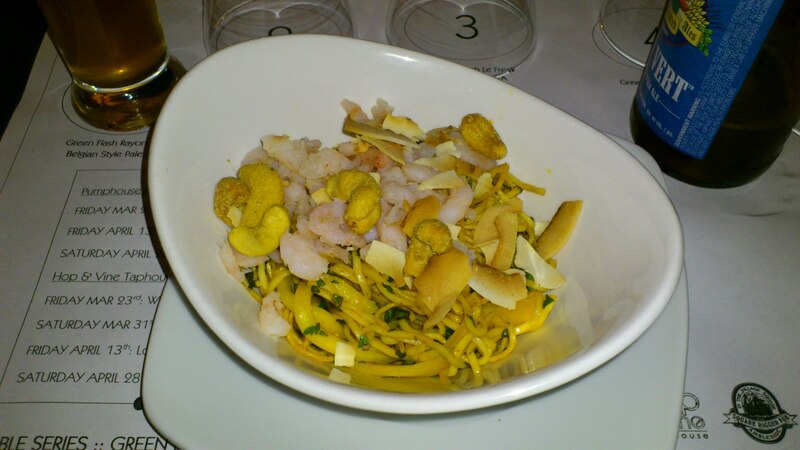 Course 1 was Thai Green Mango Salad with cold water shrimp, shredded coconut, bean sprouts and cashews. 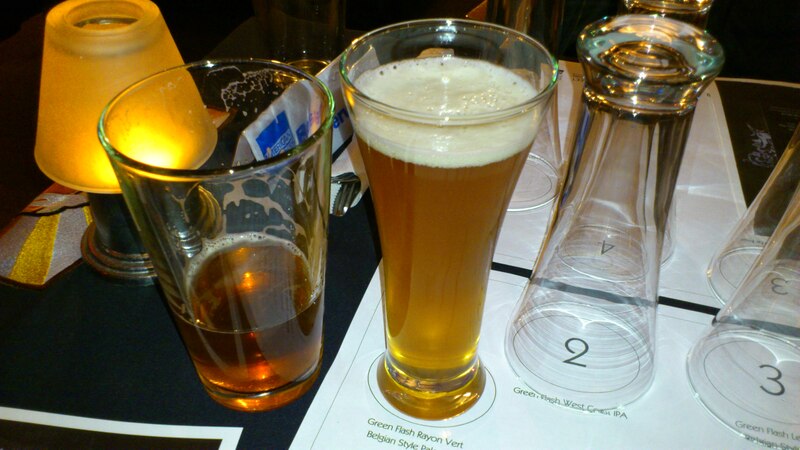 It was paired with the Rayon Vert, a Belgian style pale ale. Very nice pairing although the Rayon Vert has a tendency to foam up in your mouth when you drink it right after eating so it was tough to fully judge the way they complimented each other. The salad was refreshing and well balanced which is how I would also describe the beer. Nice combo. 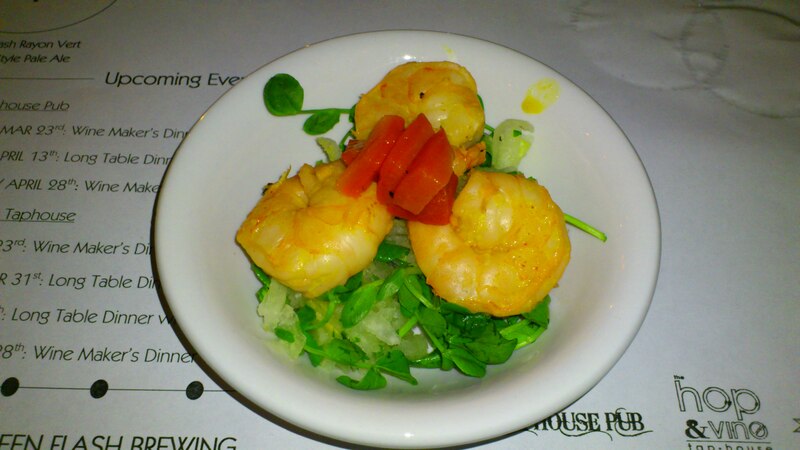 Course 2 was Coconut Curry Prawns with Jicama and Pineapple slaw paired with West Coast IPA. West Coast IPA is, as I said above, an amazing beer especially on tap and it paired very well with the curried prawns and the sweet jicama and pineapple slaw. Jicama is a strange looking root vegetable that has the taste and texture of a slightly less sweet apple so pairing it with pineapple brought out the sweetness even more. If I had blind taste tested this dish I probably would have guessed the slaw was shredded apple. Course 3 was Spicy dry rubbed Roast Beef with Caramelized Yams. It was paired with the Le Freak Belgian IPA. The Le Freak is a very hop and Brett forward beer that is not for the craft beer newbie and this was a ballsy pairing. I found that it paired very well with the caramelized yams, slightly less so with the beef. There was something about the sweetness of the yams that made a great partner to this aggressive beer. Course 4 was Grilled Jerk Salmon with Miso Scallops and Coconut Rice. It was paired with the Imperial IPA. 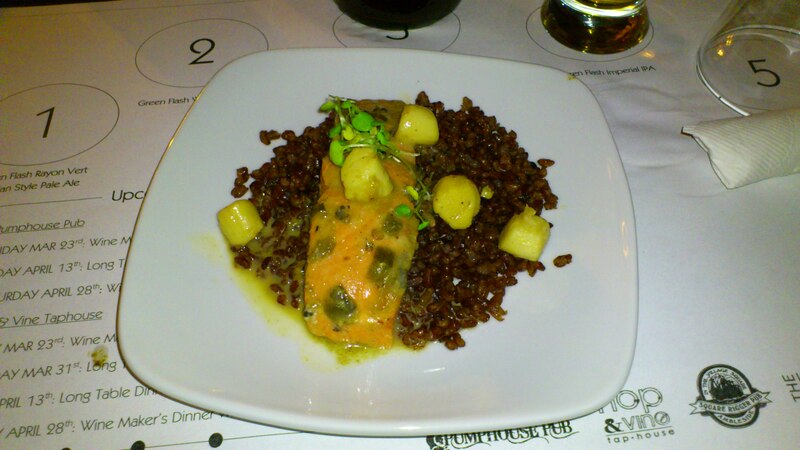 This was an interesting dish, the salmon was a nice partner top the very hop forward IPA but the scallops didn’t really seem to fit with this dish. The rice was an interesting choice as well. I think it was arborio rice which is typically used for risotto but it was prepared like regular rice for this dish. I’ve never had arborio rice prepared this way and I’m not sure I would ever use a grain with such potential in such a pedestrian way. The IPA was, as one would expect, fantastic just like everything that Green Flash does. 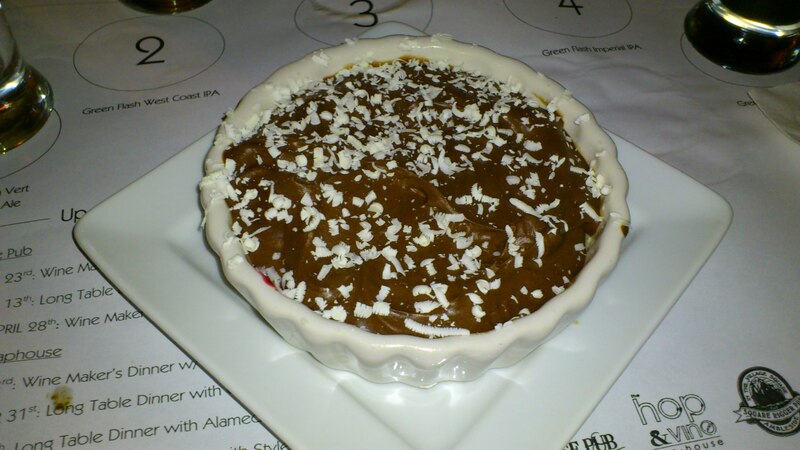 The 5th and final course was Chocolate Velvet Pie (aka Mouse) with a Raspberry Shortbread Crust and Grated White Chocolate. It was Paired with the Double Stout, an 8.8% abv monster that is frighteningly easy to drink. It’s so well balanced and has such amazing flavours that you don’t realize you’re getting absolutely plastered until you try and walk. The mouse was a very safe but very good pairing, stouts and chocolate are a no brainer. The raspberry crust wasn’t my cup of tea but that’s because I don’t like raspberry…weird right? So there you have it folks, you should really come out to one of these things as they’re quite awesome and usually sell out for a reason. Beer and food pairings offer so much more variety and depth than wine could ever hope to, in my ever so humble opinion. I think a contest or something is the next logical step to get some new faces out to one of these great dinners… Now I just have to convince Norm.